Dell held an analyst event in Austin a couple weeks ago (titled “Services and Solutions for the Virtual Era”, or SSVE), coming out strong with its message of transformation and growth via an expansion in the general “enterprise IT” space. This was primarily based on two, traditionally non-Dell lines of business. Our strategy around the efficient enterprise and flexible supply chain continues. We continue to develop and acquire key IP and enhance our sales capabilities. And we’re also narrowing our focus on three key solution domains, namely end user computing, data center and information management and services and all things cloud. Each of these solution domains represent key areas Dell has to win. If FY11 was largely about getting operationally fit, then FY12 is going to be about leveraging this position of health and strength to move more aggressively and accelerate our transformation as a services and solutions company. Customers are now seeing Dell in a fresh light and we’re heading into the new year with strength and optimism. The up-shot is that Dell is trying to grow beyond its “cheap boxes” niche, which of course it should be. Dell is trying to become like those other “elder companies” out there: IBM, HP, Oracle, and a handful of others that dominate in the space of hardware, software, and services. For Dell, this is the way out of all their problems. That problem, as my investing friends would tell me, is being perceived as a low to no growth company. Microsoft is in that spot as well – and the pitch-fork mob of growthies have recently been let loose on Redmonk more than usual. It’s still not entirely clear how Dell will first become a peer of and then win against the likes of IBM, HP, and Oracle (the tactics that is), but you almost don’t expect them to spill their playbook enough to make you feel like it’ll work. What is clear is that, product-by-product, Dell has a lot to offer: they’ve got a software division on their hands if they can realize it and start running it as such. As a “one stop shop,” Dell is at the beginning. While Perot allows them to speak to health-care as a vertical (“applications” and “solutions,” if you will), they need to build up more of these “solutions” with actual software and skill. The needs are things like: building up the IT for new banks from scratch, saving telcos from being stupid networks, leaning up government IT, modernization efforts, and other massive IT changes. The rest, from Dell, is actually pretty good. Dell can talk to being additive to acquisitions, esp. in storage, but also in servers where Dell has been good at innovating and delivering to new needs for boxes from traditional profiles to “custom” orders of 50,000+ units for high scale web shops. Also, see the quick video interview Barton George did of my reaction on the first day. Most of all, what I like is that Dell is building a software division. I don’t feel like they really think this exactly, but they should (and they’re certainly acting like it). Software is what will allow Dell to grow in the enterprise, giving their customers a reason to buy Dell systems (or “solutions,” if you like) rather than just boxes. 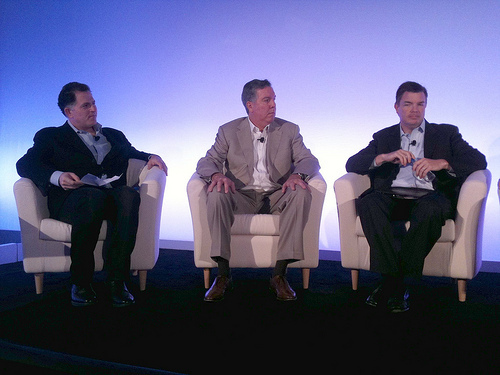 Dell needs to start thinking like a next generation ISV: something even beyond salesforce.com. What does that kind of software organization look like, how does it operate day-to-day, how does it innovate, how does it package technology, and then deliver it all to make the most profit? Rival HP needs the same thing, but Dell is in a great position: a clean-slate, more or less. Dell doesn’t have the shackles of success tying them to previous (software) revenue models and technology.